Here at Cliff Kapson Consulting, we have over 20 years of experience as a third party residential and commercial property inspector. Our specialties include stone, Exterior Insulation and Finish System (EIFS), Stucco, brick, and more. We conduct inspections for individual homeowners to large corporations. We are available for inspections anywhere in the United States and we will respond to whatever your needs may be within 24 hours. At Cliff Kapson, we take great pride in providing the most thorough inspections and comprehensive reports available anywhere. Our clients are provided with all of the information they will need to pursue any and all options, as well as the support needed to follow through. For more information on inspections for exterior insulation and finish systems or if you have any questions regarding our inspection process and services, call us today at 888-304-3437. You can also reach us by filling out the contact form located on this page and one of our experienced associates will return your inquiry as soon as possible. EIFS is commonly referred to as synthetic stucco or Dryvit. It is a commonly used material and can be seen on thousands of hotels, motels, office buildings, strip malls, and homes. 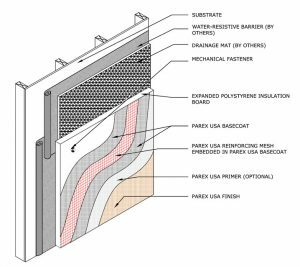 It is a very energy efficient material because it provides a virtual blanket for the exterior of a structure through the use of EPS foam insulation. EIFS can be inspected utilizing a few methods. Some of the methods include a visual inspection of the exterior to identify areas where moisture may be able to make it through the EIFS. Other methods are more invasive, which should be conducted for a full comprehensive inspection with accurate results. To learn more about our third-party EIFS inspection process or if you have any questions about our other inspection services and resources, call us at 888-304-3437 today. Or simply fill out the contact form on this page and we will respond shortly.